This dish created for a cooking game where the ingredients are restricted from a selected list came out very tasty and delighted my family very much. I made a selection of the ingredients, which I had on hand and picked some winter savory (satureja montana) from the garden. For the cooking way I decided to create a new dish inspired by a vegetables stew with cheese, we got in Gran Canaria called “pisto”. Usually this dish is served with eggs, but in this case the cheese took the most important part and a so simple dish turned out in a great stew! I’ve served this recipe as single portions in clay pots, but you can also place this is only one bigger oven proof mold. Serve with croutons or with a slice of rustic bread. Fry in a saucepot the onions and the garlic for a few minutes just until translucent. Add the mushrooms and fry until they begin to change the color and they smell “roasted”. Add tomatoes, broth and Worcestershire sauce, bring to boil and reduce the heat, simmer for about 15 minutes or until the most of the liquid is adsorbed. In the meantime, preheat the oven to 220°C (430°F). Add herbs, pepper and if needed salt to taste. Add more Worcestershire sauce if you like. Transfer in the molds for the oven, top with cheese and insert as savory spring. Bake in the oven at 220°C (430°F) for about 5-10 minutes until the cheese begins to change the color. Comforting and tasty soup, easy to prepare and to adjust to your taste. Roasting the veggies makes a big difference and the flavor will be improved. You may change the spices and herbs to taste, you may also use pumpkin instead of carrots and why not perhaps beet roots, tomatoes and red peppers! For an Asian taste you may replace the broth with a mixture of water, coconut milk and light soy sauce. Create your own soup and enjoy! Place carrots, potato and onions in a baking mold, toss with olive oil and bake at 220°C until veggies turn soft and roasted. Add garlic, broth, ginger and nutmeg. Blend with your hand blender until smooth. In the meantime slice the reserved veggies. Serve topped with the sliced veggies and green onion. This year the summer seems still far away, rain and low temperature inspired me to prepare a soup for dinner. Since years I wanted to prepare a tortilla soup and finally today I made it, we loved its strong and wonderful taste. It’s simply, rustic and very comforting recipe, exactly as need during these bad weather days! To prepare a real special soup I decided to roast the veggies in the oven before preparing this soup and used those for the base of the soup. I did not add chicken and avocado as I did not have them on hand but I certainly would do it next time if available. Place tomatoes and peppers to roast under the broiler or roast in non-sticky skillet (use an old one!). Roast on all sides. Place the veggies in a bowl, cover and let for 15 minutes. After this time it’s easier to remove the skin. Save their liquids. Blend the veggies together with onion, garlic, cilantro, water and bouillon until smooth. Pour mixture in a pot and bring slowly to simmer, adjust with salt, pepper, lime juice and chili flakes to taste. Add chicken if desired. Simmer for about 20 minutes. While the soup is simmering roast the tortillas in a non-sticky skillet stirring constantly with the oil until crisp as desired. Serve the soup in the single plates, top with avocado pieces, hot tortillas and the cheese. Dot with the cream cheese mixture. Serve immediately. The French “soupe de poisson” is very famous and popular not only in France since in Italy, Spain and Croatia. The original fish soup was prepared should be prepared with different kind of fish and seafood using the head, shells and fish bones for the fish stock first. In our case I used what I had in the freezer: calamari, shrimps and fish filets; please free to change the kind and the quantities of the fish/seafood. The shrimps were already deveined, but shell on: I remove the shell and used it for the basic fish broth. The stomach of the calamari had been removed, I used the body and the tentacles for the soup but I used the other part of the head (I removed the eyes first! for the basic fish broth as well. No fish heads were available, but I found that it could work without them. I used vegetables give flavor and thickness to the soup. We enjoyed this soup with homemade bread and skordalia (Greek potatoes and garlic spread). Note: if you don’t have fish bones… use a fish stock, you will need to cook the veggies (step 8) for only about 20 minutes or until done. First of all prepare the shells, heads or other parts of fish which would be suitable for the basic broth. Heat 2 tablespoons of oil in a deep pot and fry the shells, heads … until fragrant. Remove from pot and set aside. Heat other 2 tablespoons of olive oil, add onion as well as whole garlic cloves and cook until translucent. Add wine and let boil for a few minutes. Add water, carrot, tomato, potato, bay leaf and thyme. Bring to boil and season with salt and pepper. Place the fried shells, heads, fish bones… in small kitchen towel, close this with a knot or cord. And place this in the pot as well. Cover and let simmer for one hour, but remove bay after 10 minutes or so. During this thyme slice the squid, but fish in bite sized pieces and refrigerate until needed. Remove the bag with the fish and pressing out the precious juices. Blend the vegetables in the fish stock, if necessary sieve them to get a smoother base. Add saffron, fish and calamari. Cook for about 30 minutes more without stirring. Add more water if necessary to taste: you would like a creamy but not too heavy soup. Add shrimps, season again if necessary. To go with this toasted bread, croutons or simply rustic bread. The winter is approaching and I needed something easy, tasty and comforting. The inspiration came from Marion’s recipe http://www.justapinch.com/recipes/soup/other-soup/soup-de-chalet.html and I prepared it with the vegetables suggested in her recipes. The main change was using a fondue mix I had in the fridge that needed to be used. Well, this mixture is not simply grated cheese for fondue, since a combination of cheese, liquids (I’m not sure it was wine) and cornstarch. If you don’t have this mixture I suggest to combine 100 g cheese (as Gruyere), 50 g cream-cheese and 50 ml white wine. Heat butter in a pot and sauté leek, onion, carrots and potatoes until the border of the vegetables begins to brown. Add spinach and sauté stirring constantly for about 2 minutes. Add broth and wine. Let simmer for about minutes until potatoes are soft. Add the cheese mixture and stir until cheese is dissolved. Season with nutmeg and adjust salt and pepper to taste. Serve immediately and add grated cheese if desired. Today inspiration were beets. These wonderful reddish roots are available fresh or already boiled. With a handful of ingredients I created an exotic dish and I found a way to use the same ingredients for different steps. 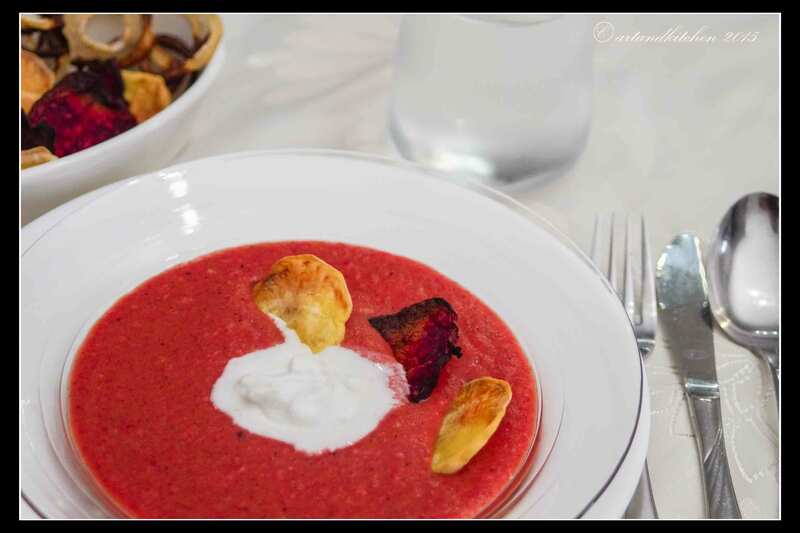 For examples the beets and roots, were used for the soup but also to create crispy chips as addition to the soup. The coconut milk gives to the soup a delicious taste but I also used some to fry the onion and finally also for the topping. So we are, here my recipe suggestion. Cut 1/3 of the roots (beets and potatoes) into thin (about 2 mm) slices and place in the oven at 200°C/400°F on a single layer on a parchment paper. Bake turning from time to time to dry. Remove the dried sliced and set aside. Note: you may also dry a few slices of onion. In the meanwhile pour 3 tablespoons coconut milk in a non-sticky skillet, heat to reduce the water content and add the diced onions and ginger to “fry” turning frequently until light browned. Dice rest of beets and potatoes and place them into a pot along with the broth and bring to simmer. As soon as the onions are done add them to the pot. Simmer at low temperature until potatoes are soft. Puree using the hand blender. Reserve about 2 tablespoons coconut milk and add this to the soup, stir gently and serve immediately. This tasty, fragrant and light soup is so good that you will make this again! 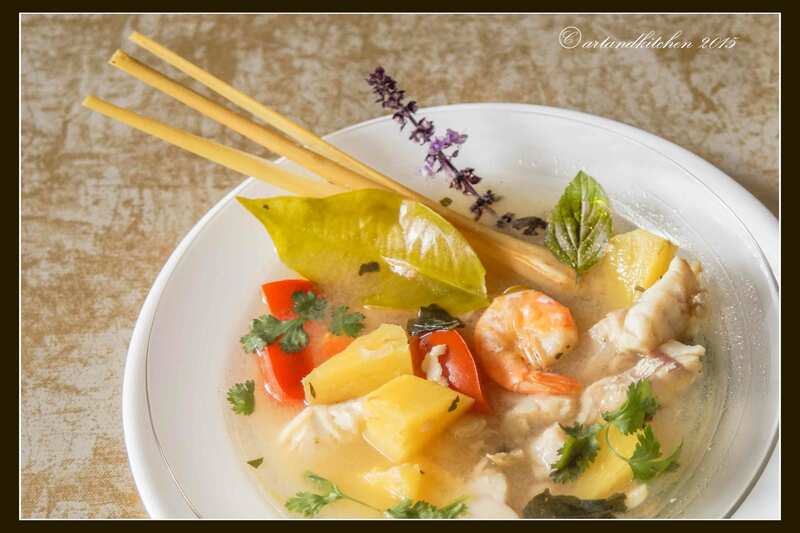 The first time we had this delicious soup was in Sihanoukville in Cambodia in a small restaurant called “Rose’s place” and where it is called Somlaw/Somlor Machu Youn.Similar versions of this soup are known in Vietnam where this is called Canh Chua Thom Nau Ca. Notes of a simplified version of this soup taken during our vacation in 2004: Heat chicken stock, add pineapples chunks and sliced cabbage. Let boil for 5 minutes, add fish and season with sweet Asian basil, fresh cilantro and sawtooth cilantro. This is the version I would like to propose you now! Saw leaf herb, optional if you can find it! In the meantime heat the oil and fry garlic as well as fish and shrimps. Add to the stock the stir fried fish and shrimps. Season with fish sauce, chili peppers, pepper and sugar. Cook covered for 2 minutes. Ladle into individual serving bowls or soup dishes and serve garnished with herbs.